Since I began reviewing the 1980 UFO experience of Betty Cash, Colby and Vickie Landrum, in 2011, I’ve been searching for original reports, documents, photographs, even the earliest media coverage, the best collection of primary sources on the case. The story, early on, was transformed almost into a fairy tale or fable, and most accounts read like a story book tale. To get past the legend, to the facts of the case, I wanted to begin with the Mutual UFO Network original report, but no one seemed to have it. Or if they did, were unwilling to share it. In pursuit of it, I located other files and correspondence from UFO organizations that had participated the investigation of the case, the Center for UFO Studies (CUFOS), the Aerial Phenomena Research Organization (APRO), The Fund for UFO Research (FUFOR), and investigators ranging from the super-skeptic Phil Klass to the wide open minded Dr. Leo Sprinkle. 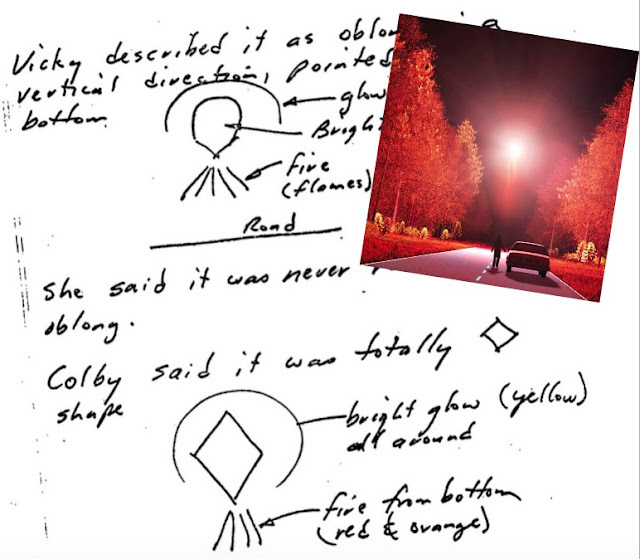 I’ve put most of those files online in the section of the BBL site, The Cash-Landrum UFO Case Resource Guide. However, the original case report filed to MUFON eluded me- until now. and it came with a lot of company. 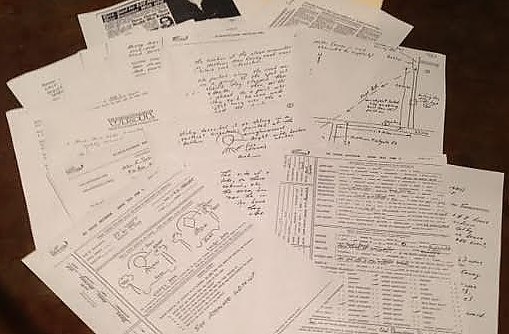 On November 11, I received a batch of documents from a former MUFON Mutual UFO Network officer, nine folders containing over 700 pages on the Cash-Landrum events, including case files, news clippings, magazine articles, manuscripts of MUFON articles and symposium lectures, correspondence, witness interviews, legal filings and more. There is some duplication from one file to another, often from a document being forwarded as part of correspondence, but that’s interesting, too as it shows how the information on the case was shared- or restricted. The first week was spent reading and indexing the file collection to isolate the portions that were new to me. Doing so, I took note of what was missing from the files. There was little reflecting the efforts of organizations other than MUFON, and there were also curious absences in the media coverage and conspicuous gaps in the case files themselves, missing primary documents, transcripts of interviews that were quoted elsewhere. It should be noted that there were no medical records of any kind, just summaries and correspondence discussing the health of the witnesses. The file collection, though very large, is incomplete. A key point of interest in the files are the documents released to reporter Billy Cox in response to his 1983 Freedom of Information Act request. I filed a FOIA for these same information in 2011, but was told the “records are no longer available for retrieval.” The contents of that file (along with some other documents) show a different picture of the military’s involvement with the case than the portrayal in UFO literature. Instead of a cover-up, there are numerous instances of government officials expressing interest in the case, military personnel cooperating and sharing information. The FOIA material does not support the witnesses’ account of a UFO and helicopter near Houston Intercontinental Airport, and much of it has effectively been suppressed, ignored by ufologists chronicling the story. Having become familiar with the new material, I am now in the process of incorporating the new material in chronological order and incorporating it into my existing case documents. After that, a re-examination of the case files will be necessary to see how the new material fits, if inconsistencies are found (yes, there are some noticed already) and to identify and follow up the cold leads. Also, there’s some further information about the meddling the case by William Moore and Richard Doty, their promotion of rumors of a secret experimental US craft powered by alien technology, and their manipulation of APRO and the UFO community to this end. I’ve provided three trusted colleagues with copies of the files for safekeeping, and to demonstrate the authenticity of the documents. The work on the files continues, and my plan is to eventually share them, all or in part, in the documents section here. Before that happens, redactions like addresses and phone numbers will have to be made in order to protect the privacy of the living individuals involved in the correspondence. This entire process is going to take some time, but I hope to provide updates along the way. Very exciting Curt,this case has always bothered me in that there was obviously an object witnessed but the amount of helicopters seemed extreme to say the least. Could it be the helicopters were some type of manifestation,recognisable but still part of the temporal reality we call the ufo. After all ufos have often been reported to change shape,dematerialize,pass through solid objects etc so the idea that the phenomenon could manifest as a large fleet of helicopters is entirely possible when we are dealing with the greatest unknown. Just a thought..keep up the good work. Thanks! Yes, the helicopters are perhaps more puzzling than the UFO itself. I've never believed there was a "fleet" of helicopters, but I did think there were maybe one or two circling that, in the fear and excitement of the moment, were counted multiple times. Now even one or two helicopters seems very doubtful to me. At this point, I think the reported helicopters were either a memory that transformed over time (like a fish story) or an attempt to strengthen the case. Sigh. I suspect the complete medical record (not just summaries) is probably lost. Old paper medical records weren't routinely digitized before destruction. Having spent 20+ years in health care, I know how far behind the curve it has been when it comes to electronic record keeping and administration. Health care professionals fought conversion to technology into the 21st century, and capitulated only when forced by the federal government to submit data electronically in order to receive Medicare payment. HIPPA now is being used in some instances to strictly limit the release of historical medical records. Likely, your best hope for laying hands on a comprehensive medical record is a family member or some obscure researcher, who managed to get a copy back in the day, sharing it.